Stocks are lower this morning on no major news. Bonds and MBS are down small. January auto sales are generally coming in below estimates this morning, which has largely been attributed to the weather. Bad weather in the Northeast didn’t stop the ISM New York survey from jumping to 63.1 from 44.5. This is the highest reading since September. The IBD / TIPP Economic Optimism Survey rose to 49.1 from 47,5. Lumber Liquidators fell 25% yesterday after a 60 Minutes report said that there were unsafe levels of formaldehyde (a carcinogen) in its Chinese-made flooring. The company disputes the report and made a filing with the SEC claiming that all of its flooring meets the safety standards set by US regulators. The company blames short sellers for feeding the report to 60 minutes. FWIW, the days to cover has jumped over the past month from about 8 to 14.5. While not quite Herbalife, this one could become a battleground stock. The absence of the first time homebuyer has been an issue for the real estate market, both in terms of transactions and new building. Housing formation has been depressed since 2006 as a combination of unaffordability during the bubble years and a tough job environment for new grads post-bubble has kept household formation low. Note the Millennial Generation is actually bigger than the Boomers – so this isn’t due to fertility rates 25 years ago. 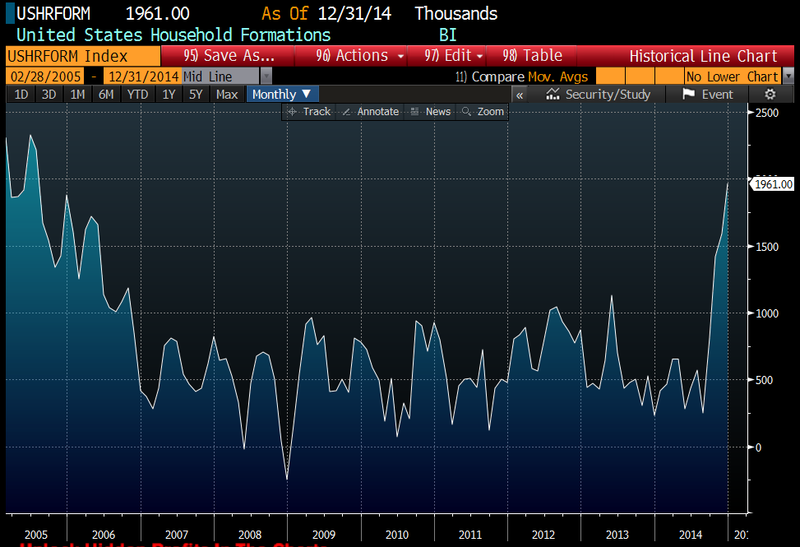 It appears that household formation has finally rebounded at long last. Granted, many of these new households will be renters, but it seems like we have at least made the leap back to normalcy (latest reading is just under 2 million) and we are out of this depressed range of 250k – 750k households forming a year. Now if we could only get housing starts back to a normal range of 1.5 million to 2 million, we would be in good shape economically. In other news, sun rises in the east. It’s a legit scandal and the media likes clicks. It’s good for web traffic and for getting on TV, plus it’s more interesting than the Clinton is inevitable narrative. Now they have some controversy. They aren’t doing that well financially. Stopped over at Plumline for a moment, discovered that Israel is the entire problem in the middle east and is a racist, apartheid state. Someone should tell that to the Arab members of the Knesset so they can do something about that. Which is why we should have the government start using taxpayer money to underwrite all “major” newspapers, in order that the public doesn’t lose that vital source of sound information and detailed reportage. That is petty much the rationale in the UK for the government funding the BBC. The telly tax… reminds me of the Young Ones episode where Viv tries to eat the TV.. I always got a kick out of the fact that you got a discount if you either had a black and white TV or were blind. They should probably bring it into the 21st century by giving discounts to those with non-HD TVs. Did she have to think in Russian? Is there a conceivably benign explanation for HRC’s use of a personal e-mail account to conduct State Department business? I cannot think of a benign explanation. Considering that her personal account was insecure and as open to hackers, foreign and domestic, as mine is, I consider the problem to be one of stupidity, arrogance, and recklessness. If she was too lazy to use two email accounts divided by function that is tellng. If she thought she could hide personal matters in an insecure email account, that is arrogant and stupid. If she plain did not know that she was supposed to use secure State Department email for State Department business that is incredible on either level. BTW, if she tried to hide stuff in a personal email account that will probably come out now. By using her personal account for business it seems to me she loses any claim to privacy from the Inspector General, who may have access to stuff she thinks she deleted. I lean toward stupid and arrogant and reckless, rather than secretive, for the reasons stated. Hardly benign. Most innocent explanations I have read: govt servers go down often enough that using them is often a PITA; govt servers are not more secure than AT&T or TWC or Verizon; and she criticized the GWB Admin for the same thing…with no negative effect on them, so why worry now? No. What I find so brazen about it was that she didn’t even engage in the fiction of having a government account too. Between that and the NHS I suppose it’s helpful that the UK reminds us how much worse things could be. “Should women be allowed to sign up for Obamacare when they get pregnant? Should homeowners be allowed to get fire insurance after their house burns down? We’re not talking about homeowners who are gaming the system, waiting to buy insurance until they need it. We’re talking about homeowners who might not be planning on having their house burn down. I come down on the opposite side. The fact that she set up her own personal domain registration “clintonmail.com” on the day that she started her confirmation hearings means that it was done intentionally, and with malice aforethought. This wasn’t an oversight where she continued to use an existing personal account that she had previous to entering government service again. This had one purpose: To ensure that HRC and no one else would be in control of her communications so that they could not be used against her in any future potential investigation and/or to cause her political problems should she choose to seek higher office. Same as with Romney purchasing and destroying the computers of his gubernatorial administration. Keep in mind that she most likely hosted her own system and wasn’t using a third party. It wouldn’t surprise me if she’s already scrubbed and wiped what she didn’t want to come out. If you weren’t trying to game the system and you didn’t anticipate your house burning down then it’s not fair to penalize you for not planning ahead. I am trying to decide whether the Twilight Zone or Alice in Wonderland better describes the world of Obamacare proponents. Subjective intent is all that matters. Unless they are trying to “game the system”, it’s unfair to penalize someone for bad luck or bad choices. Unless they are trying to “game the system”, it’s unfair to penalize someone for bad luck or bad choices. A good example of how the left corrupts language and concepts. The notions of “fairness” and “penalize” as normally understood do not actually apply. Yes absolutely. That’s how any business that hosts it’s own E-mail works (including the one I work for). And if she was concerned about security and control she absolutely wouldn’t want Google or any other third party hosting it. She would need some technical people to run it, but I suspect that the Clinton Foundation has a pretty robust infrastructure and could assist her. Or out of a PAC, etc. She also made a point of using the private registration option with Network Solutions so that no one can see exactly how it’s being hosted. This is also good practice in general to help avoid spam and other hacking attacks. It’s even better than I thought. The server that’s registered for her domain is in the British Virgin Islands. No US subpoena for her. I don’t want to be too over-the-top, but how can this not be an absolutely huge, candidacy-ending scandal? Imagine if it was discovered that Jamie Dimon had never obtained an @jpmchase e-mail address, had been communicating and conducting business via his own personal domain, and that JPM had no records of his business communications other than those that Dimon himself provided after the fact. Do we even have to wonder how that would be played out in the press/government, and what would become of him? Or that JPM would be fined huge amounts of money for regulatory violations? Unfortunately I am too cynical to expect that she won’t get away with this relatively unscathed. Scott, it’s almost as if you don’t accept First.Woman.President isn’t enough for you? Never attribute to avarice that which can be explained by incompetence. That is why I asked, because I don’t see how this can be explained by incompetence. Obtaining your own domain, where you set up and have total control of your own e-mails, on the eve of getting a big job in which there will be an outside desire to scrutinize your communications, doesn’t strike me as an indication of incompetence. Quite the opposite, actually. People would have to care sufficiently to make it a candidacy-ending scandal, which may happen but I doubt it. As you surely know, the way the media handles the presentation of a scandal can have a big influence on how much people care about it. Repeated questioning and daily front page coverage has a different effect than a story on page A17 that is never brought up again. Yes. But it can also look like it has been done and not be, and once you’ve got email flying about hither-and-thither, you can end up leaving all sorts of bits and pieces that sufficient forensics can reconstruct, not to mention the likelihood that at some point her communications could have been and probably were being spied upon. The CIA and NSA are not exactly known for avoiding domestic spying. But assuming it’s been collected and archived in some manner, it doesn’t mean it’s all going to come to light. Because no one is changing their vote based on it. And yes she will get away with it. She benefits from a lack of specific individual penalties being spelled out in the law as it was at the time that she violated it. She’ll also probably invoke the blame subordinates defense. Rules are different for the government. To give Obama some credit, he did improve matters here with the new law. Because no one is changing their vote based on it. They might if there was a media determined to make it so. The key is to locate the hosting it in a manner that a US Congressional subpoena or some other public interest group can’t access it without going through her or her agents. She doesn’t want Google to be in a position of being able to turn over everything without her being able to execute a veto or just destroy it beforehand. British Virgin Islands probably slows down the process enough so that suffices. And she’s not worried about the NSA. I would assume not, but one never knows when some individual in the organization is going to go rogue. I’m dubious that would happen with Hillary, unless there was a rising star in the Democratic party that many powerful people in the party greatly preferred to Hillary. I have no doubt it won’t happen. Hence my general disdain for the media. Then clearly, it should be attributed to chutzpah, given that it is practically flouting standard practice in plain site. With no effort to make it even look innocent. The answer to that question is as it ever was: She is Hillary Clinton, and she believes, with some justification, that she will get away with anything and everything she tries. “Why,” supporters grumble, “knowing full well how effective the charge of elitism can be during a presidential campaign, does she continue to take $300,000 per speech?” Answer: Because she’s Hillary Clinton. “Why,” others inquire, “when tempers are still hot and nerves are still frayed, does she continue to take money from the outfits that are widely blamed for the financial crisis of 2008?” Answer: Because she’s Hillary Clinton. “How could she possibly believe that her ex-president husband’s temporary inability to buy a multi-million-dollar house rendered her ‘dead broke’”? Because she’s Hillary Clinton, and she has a sense of entitlement that would make Imelda Marcos blush. And so, having been championed and overpraised for years, lionized more for her immutable characteristics than for any concrete achievements, and allowed to pretend that her few successes have been the product of her own ability and not her husband’s uncommon political talent, Clinton has of late fallen disastrously deep into the professional celebrity’s most pernicious trap: She has begun to believe her own hype. I seem to recall something about Sarah Palin’s email choices as being evidence of her unsuitability to be VP (along with numerous other things, of course). Makes clear that you are probably correct on motive, JNC. My favorite D is Mark Warner and I hope this gives him an opening, frankly. Obviously, the liberal Ds will be clamoring for their Bold Leader, the distorter-of-facts- to-suit-her-narrative. HRC also benefits from the fact that political corruption is already known and assumed with her. It’s already been discounted by the market. If you support Clinton, you aren’t concerned about ethics. Hard to believe that I can find this out in 2 minutes on Google and the AP can’t. Edit: To be fair, they may be referring to where it was hosted while she was Secretary of State. That’s not immediately clear. BVI is the current location of the server.